There have been three “Back to Wagga” events over the years : 1927, 1956 and 1970. The pick of these, in my view, would have to be the very first, in 1927. The week long celebrations, presided over by a committee (which, ahead of its time, included two women in a group of ten) were the focal point of community interest and participation over a number of months leading up to and during the festival itself. Community events were packed into daily programs: athletic carnivals, tennis tournaments, Diggers “smoko” ( a gathering for WW1 surviving ANZACS) church services, movies, a massive dance line up at the Dixieland, chess and draughts tournaments, massed displays of dancing and marching by school children, and my favourite, a huge confetti battle at the end of one day’s events, which, it seems, anyone could join in . Local bands including the City Concert Band played. Local businesses got on the “Back to” bandwagon and worked the theme into their advertising and specials. 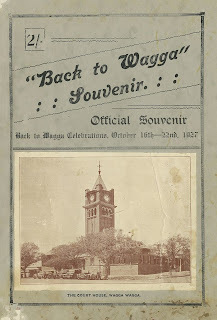 The “Back to Wagga” souvenir for 1927 contains some over confident, self-congratulatory self -adulation, appropriate for the time, but slightly nauseating to read now, and if you can get past that, the booklet is quite a good resource for researching the mainstream side of between-the-wars Wagga Wagga just before the full force of the Depression hit.